What is the most recognizable object in the world? Could it be a football? Or a Big-Mac? No, the answer is a Coca-Cola bottle. The famous Coca-Cola bottle is almost 100 years old ! Footballs and big macs are certainly part of life for lots of people; but Coca-Cola is now a permanent part of world culture. People know and drink Coca-Cola all over the world. 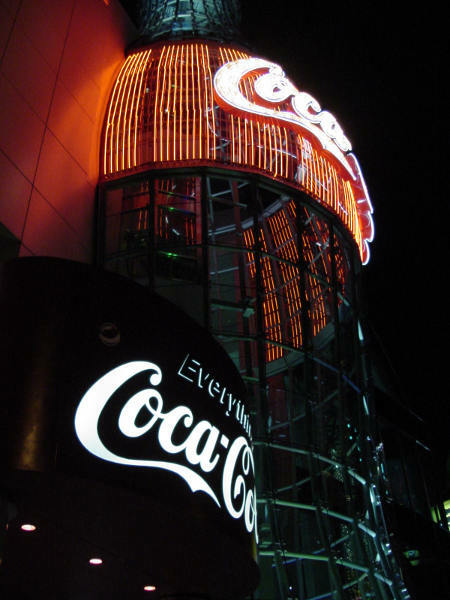 It is said that the Coca-Cola bottle is the most recognised object in the world. Hundreds of millions of people can recognise a Coke bottle by its shape, even if they cannot see it! And the famous Coca-Cola logo is the most famous logo in the world. Unlike any other famous commercial logo, it has not changed in 100 years! But the story of Coca-Cola is even older than that. It was in 1886 that John Pemberton, a druggist in Atlanta, Georgia, invented a new type of syrup, using coca leaves, sugar and cola nuts, plus a few other secret ingredients! Pemberton sold it as a medicine; and with its coca (the source of cocaine), it must have made people feel good! Nevertheless, Pemberton's medicine was not very successful, so he sold his secret formula to another druggist, Asa Candler. Candler was interested, because he had another idea; he thought that Pemberton's "medicine" would be much better if it was mixed with soda. Candler was thus the man who really invented the drink Coca-Cola. At first he sold it in his drugstore; then he began selling the syrup to other drugstores, who used it with their soda fountains. Candler also advertised his new drink, and soon people were going to drugstores just to get a drink of Coca-cola. Before long, other people became interested in the product, including a couple of businessmen who wanted to sell it in bottles. Candler sold them a licence to bottle the drink, and very quickly the men became millionnaires. The famous bottle, with its very distinctive shape, was designed in 1916. Today, Coca-Cola is made in countries all over the world, including Russia and China; it is the world's most popular drink. As for the famous formula, it is probably the world's most valuable secret! The exact ingredients for making Coca-Cola are only known to a handful of people. And as for the "coca" that was in the original drink, that was eliminated in 1903. It was a drug, and too dangerous. Today's Coca-Cola contains caffeine, but n in 1903. It was a drug, and too dangerous. Today's Coca-Cola contains caffeine, but not cocaine! Printing: Best for printing from the Firefox browser. Using information from the article, complete this résumé in your own words..
was the ___________ of the __________ of Coca Cola. Divide pupils into pairs, and have each pair script a dialogue between John Pemberton and Asa Candler; or between the two businessmen who want to buy a license to bottle and sell Coca Cola. This teaching resource is © copyright Linguapress 2000-2017. Revised 2017 . Originally published in Freeway, the Intermediate level English newsmagazine. Who were the Beatles ?